April TBA: Chandrayaan 2 lunar orbiter, lander and rover. This schedule is subject to change. Please check with our friends at Spaceflight Now for updates. 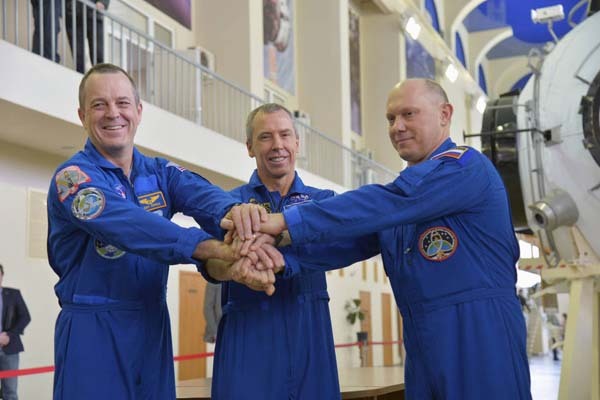 NASA astronauts Drew Feustel and Ricky Arnold and Russian cosmonaut Oleg Artemyev of Roscosmos will fly to the International Space Station. Allowing for delays most likely 4 or 5, how else do you think they expect to reach a cadence of 30-40 non-starlink launches a year? Interesting to note Bangabandhu 1 is on the first block 5 and TESS is on the last new Block 4. Still, the current plan is to put up 6 missions in 33 days. Even if that interval expands into early May, it’s an impressive cadence with multiple 2-week pad turnarounds. That will be especially the case if the only delays are due to weather. Yup, the gap between Atlas V and F9 in total launches is sure shrinking quickly.